At the Couflens Project, Apollo Minerals is working towards the reactivation of the historical Salau tungsten mine whilst conducting aggressive regional exploration programs across the surrounding license area, focused initially on gold. 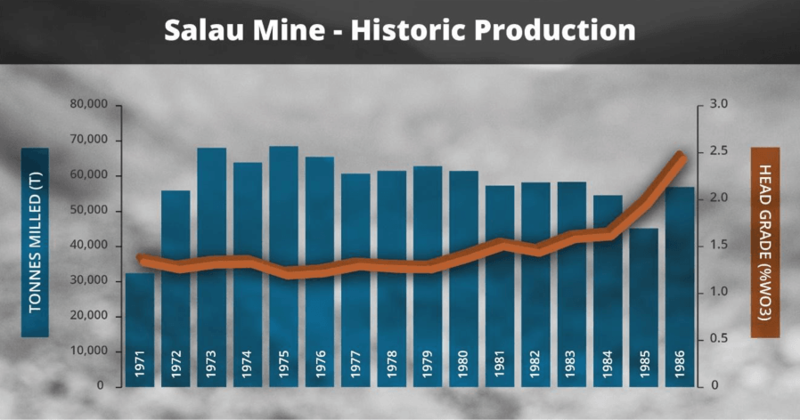 The Salau mine, which remains open at depth with significant gold potential, was previously one of the world’s highest-grade tungsten mines, producing tungsten at an average grade of 1.5% WO3. Apollo Minerals is committed to developing a modern and responsible mine, we value transparency and we are committed to creating sustainable value for all our stakeholders. Apollo Minerals’ vision is that the Couflens Project will once again become a major strategic supplier of tungsten to French and European industries from its location in the heart of the European Union. Tungsten has been rated one of Europe’s most critical raw materials by the European Union and is vital to the aerospace, manufacturing, automobile and military industries. The supply of tungsten is heavily dominated by China and, given the unique properties of tungsten and the inability to substitute it with other metals, the security of its supply is a growing concern among European businesses and governments. Against a backdrop of renewed support for the mining industry in France, Apollo Minerals is committed to developing the Couflens Project. All work programs at the Project are conducted with a strong commitment to both sustainable development and proactive stakeholder engagement, from the local communities to the national government. Apollo Minerals is focused on the exploration and development of the Couflens tungsten and gold project in southern France. The Couflens Project comprises an exploration license that covers a 42km2 area in the Pyrenees region and includes the historic Salau mine, which was one of the world’s highest grade tungsten mines when it operated from 1971 to 1986. Over its 15 years of operations the mine produced approximately 930,000 tonnes of ore at an average grade of 1.5% WO3 to yield approximately 11,500 tonnes of WO3 in concentrate. The mine, which closed in 1986 when prices were much lower than today, remains open at depth and has significant gold upside. Recent work programs have confirmed the presence of widespread high grade gold (up to 24.5 g/t) and tungsten (up to 8.25% WO3) from rock samples within the Company’s large landholding in this highly prospective region of the Pyrenees. The Company will rapidly advance a work program focused on delineating a tungsten resource in the Salau mine area. The Company will also undertake exploration activities focused on gold inside the Salau mine. Within the broader project area, the Company will undertake surface exploration to further assess identified prospects and generate new targets. Mr Middlemas is a Chartered Accountant, a member of the Financial Services Institute of Australasia and holds a Bachelor of Commerce degree. He worked for a large international Chartered Accounting firm before joining the Normandy Mining Group where he was a senior group executive for approximately 10 years. He has had extensive corporate and management experience, and is currently a director with a number of publicly listed companies in the resources sector. Mr Behets is a geologist with over 28 years’ experience in the mineral exploration and mining industry in Australia and internationally. He has had extensive corporate and management experience and has been Director of a number of ASX-listed companies in the resources sector including Mantra Resources Limited (“Mantra”), Papillon Resources Limited, and Berkeley Energia Limited. Mr Behets was instrumental in the founding, growth and development of Mantra, an African-focused uranium company, through to its acquisition by ARMZ for approximately A$1 billion in 2011. Prior to Mantra, he held various senior management positions during a long career with WMC Resources Limited. Mr Schumann commenced his career as a management consultant before moving into the natural resources sector, initially as part of an investing team in London focused on early stage mining projects and then working in corporate development functions for a number of listed mining and energy companies. He has a decade of experience in the financing and development of mining and energy projects globally across a range of commodities. He holds an MBA from INSEAD, is a CFA Charterholder and holds a Bachelor of Business Science (Finance CA) from the University of Cape Town. Mr Pearce is a Chartered Accountant and is currently a director of several listed companies that operate in the resources sector. He has had considerable experience in the formation and development of listed resource companies and has worked for several large international Chartered Accounting firms. Mr Pearce is also a Fellow of the Institute of Chartered Secretaries and a Fellow of the Financial Services Institute of Australasia. Dr Bonnemaison is a French geologist with extensive experience in Europe, Africa and South America. Dr Bonnemaison spent much of the last 35 years working with the French geological survey (BRGM) and was the Deputy Head of Minerals Resources Division. He was President and CEO of SEIEMSA, a subsidiary of the BRGM mining group in Spain. Dr Bonnemaison completed a PhD on the metallogeny of the Salsigne gold mine and is widely recognised as one the preeminent authorities on gold deposits in France. Mr Kejriwal has over 25 years’ experience in finance and commerce, and is currently a consultant to Juniper Capital, a natural resource investment and advisory business. Prior to Juniper Capital he was a banker leading many investment transactions across oil and gas, mining, real estate and asset management sectors. He has previously worked as a banker for the Principal Investments business at Nomura in London and Hong Kong, Cazenove and Co and Morgan Stanley. Mr Kejriwal is a Chartered Accountant, having qualified with PriceWaterhouseCoopers in 1994.